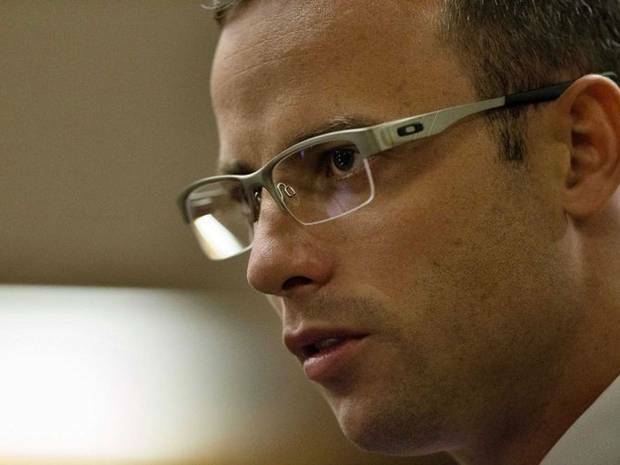 Oscar Pistorius himself took to the stand this morning , on the first day of Defence against charges of intentionally killing his girlfriend Reeva Steenkamp. Looking visibly tearful the ex paralympic star and Olympic Champion, stuttering, started by apologising to her family. He explained that he tried many times to write to them but couldn’t . Before the court was adjourned again, due to Pistorius’ exhaustion, he was asked about how many times he had been burgled and all the fears that he had about living in South Arica. According to Pistorius, his father and brother had been kidnapped, his house was burgled into when he was abroad competing and a TV and laptop were taken and that he was followed at night when out with then girlfriend Samantha Taylor. According to Emma Sadleir, a media lawyer and commentator of one of the 24hr news channels explained that, under South African law, the accused is not obliged to take to the stands but , if he decides to do so, he needs to be the first in the dock. The prosecution lasted 3 and a half weeks where, again according to Ms Sadleir, the order of testimonies were masterful . “They brought his neighbours who heard Reeva’s screams; forensics, who told the court about the scene of the crime; ballistics, who put forward evidence of the angles of the fires when shot and firearm experts who brought to court Pistorius application to hold a firearm’ which he passed with 98% correct proving he knew very well he was not allowed to fire through a door. The defence started today after a week break due to an assistance to the judge falling ill. Pistorius is not denying killing Reeva. The defence is using an unusual claim: Putitive Private defense which states that, at the moment of firing Pistorius genuinely believed his life was in danger. There are no juries at trials in South Africa and Pistorius’s fate will ultimately be decided by Judge Masipa, assisted by two assessors.